“White House Chief of Staff John Kelly and Steve Bannon have mutually agreed today would be Steve’s last day. We are grateful for his service and wish him the best,” the White House said in an emailed statement. Before Bannon, Trump already fired two other aides who helped him win the White House — Reince Priebus and Michael Flynn — but the departure of Bannon, the former head of Breitbart News, is perhaps the most significant change yet. Trump hinted that Bannon was on his way out on Tuesday, when during a press conference he was asked by a reporter if he still had confidence in his chief strategist: “We’ll see what happens with Mr. Bannon,” Trump responded, adding that while he believes he is a “good person,” Bannon “came on very late” to the campaign. On Friday, Bannon did not attend a national security meeting on Afghanistan with Trump at Camp David Friday, even though he had been involved in the debate over troop levels. Increasingly isolated by the “Goldman” wing, Bannon had few allies left in the White House following the departure of Priebus as chief of staff. The two men had formed a strategic partnership out of political convenience but had become genuine allies. His departure could be another sign that new chief of staff John Kelly has broad authority to clean house in a West Wing that has been hobbled by infighting and leaks. Bannon’s worldview is at odds with many of Trump’s senior aides, and he clashed with the president’s son-in-law Jared Kushner, National Economic Council Director Gary Cohn and national security adviser H.R. McMaster. Their feuds would often spill into the press, exacerbating tensions in the White House. And with Priebus gone, Bannon was at the mercy of Kelly, a retired Marine general who has been running a tight ship and is eager to rid the White House of drama. As the Post writes, while Bannon had been on the outs with Trump before, the president suspected Bannon was one of the main leakers in the administration, trashing his colleagues in the press. Bannon in recent days gave interviews to publications including the New York Times in which he defended Trump’s controversial comments in the wake of the racial violence in Charlottesville, Va., last weekend. The biggest risk for Trump is that Bannon is the biggest conduit to Trump’s conservative base. His departure could and likely will provoke a backlash among Trump’s core supporters, who are fearful that the president is now being advised by liberals and who they refer to as “globalists,” like Cohn, Kushner and McMaster. Breitbart News has been hammering McMaster in particular, who in recent weeks successfully rid the National Security Council of several of Bannon’s allies, according to the Hill. “Steve’s allies in the populist nationalist movement are ready to ride to the gates of hell with him against the West Wing Democrats and globalists like [national security aide] Dina Powell, Jared Kushner, Ivanka Trump, Jared Kushner, Gary Cohn and H.R. McMaster,” said one Bannon ally. Sally Yates, the acting attorney general and an appointee of former President Barack Obama, was fired by Trump just ten days after he assumed office. Yates had refused to uphold the Trump administration’s controversial travel ban in January. Michael Flynn resigned in February after serving in the position for less than a month. Flynn misled Vice President Mike Pence and other administration officials about the contents of his phone conversations with Sergey Kislyak, Russia’s ambassador to the US. Flynn reportedly discussed the Obama administration’s sanctions against Russia with Kislyak prior to Trump assuming office. Katie Walsh, the former deputy chief of staff and close ally to chief of staff Reince Priebus left the White House just nine weeks into the job to run America First, a pro-Trump group outside of the government. Preet Bharara, the former US Attorney for the Southern District of Manhattan and ‘Sheriff’ of Wall Street, was fired by Trump in March after Bharara refused to submit a resignation letter to Attorney General Jeff Sessions. James Comey, the former FBI durector, was fired by Trump in May. Michael Dubke, the former White House communications director, resigned in May. Dubke was replaced by Anthony Scaramucci, the founder of a hedge fund and a top Trump donor. Scaramucci was fired after just 10 days on the job (see below). Walter Shaub, the former director of the Office of Government Ethics, resigned earlier this month after clashing with the White House over Trump’s complicated financial holdings. Shaub called Trump’s administration a “laughingstock,” following his resignation, and advocated for strengthening the US’s ethical and financial disclosure rules, per The New York Times. Mark Corralo, spokesman for President Donald Trump’s legal team, resigned on July 20 within two months of being on the job. Sean Spicer, the embattled former White House press secretary, resigned on July 21 after telling Trump he vehemently disagreed with the selection of Anthony Scaramucci as White House communications director. Micheal Short, the former White House press aide, resigned the same day as Spicer, after Scaramucci revealed plans to fire him. Reince Priebus, the former White House chief-of-staff, resigned just six months into his tenure after a public feud with Anthony Scaramucci, the White House communications director. Anthony Scaramucci, who “resigned” as the new White House Communications Director on July 31, after just 10 days on the job. 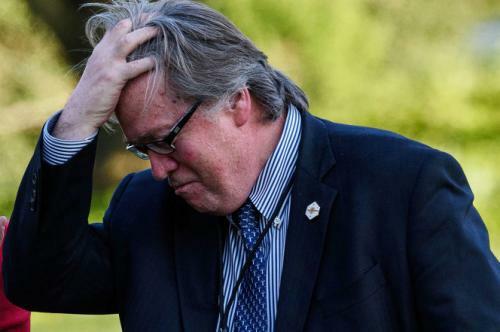 Steve Bannon, Trump’s chief strategist, who first resigned on August 7 and was then fired by the White House on August 18. The final nails were just hammered into the coffin of Steve Bannon’s White House stay. He also bad-mouthed his colleagues in the Trump administration, vowed to oust a female diplomat at the State Department and mocked officials as “wetting themselves” over the consequences of radically changing trade policy. Of the far right, he said, “These guys are a collection of clowns,” and he called it a “fringe element” of “losers.” “We gotta help crush it,” he said in the interview. While Bannon was instrumental in getting Trump elected, their alliance ruptured as Trump elevated the roles of Gary D. Cohn, his top economic policy adviser and a former official at Goldman Sachs, and Dina Powell, a former Bush administration official who also worked on Wall Street. Cohn is a registered Democrat, and both he and Ms. Powell have been denounced by conservative media outlets as being antithetical to Trump’s populist message. Cohn is a registered Democrat, and both he and Ms. Powell have been denounced by conservative media outlets as being antithetical to Mr. Trump’s populist message. And so, Goldman wins again, or as Breitbart will put it: Globalist 1 – 0 Nationalist. Markets love it, with the Dow reversing all of its earlier losses, up 32 at last check.